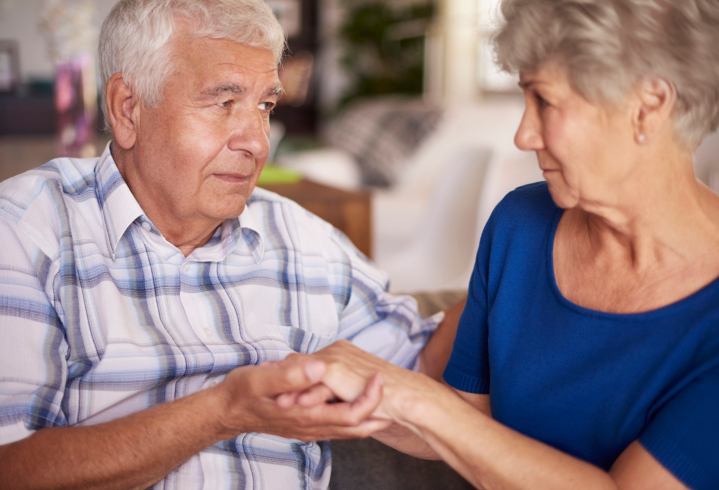 You’ve noticed that a friend or loved one is having some problems and you are worried they might have dementia. How do you voice your concerns and encourage them to seek help? • Firstly, plan when you are going to have the conversation. Timing is key. Make sure it’s when you’re both at your best, not when you’re tired from a long day at work and not when they are most likely to be irritable. You will need to be patient and diplomatic and the person you are speaking to will need to be relaxed and feeling well. • Choose the right environment. Somewhere quiet and comfortable is key. Make sure you won’t be interrupted – turn off the TV and put your phone on silent. Rule out any distractions. • Decide in advance what you are going to say. Explain first that it’s important for you to have a conversation and why it’s a good thing to be able to talk to family members or loved ones when you are concerned about them. • Gently express that you are concerned about them because they haven’t been themselves lately. Don’t say it in a critical or accusing way – otherwise they may become defensive. Use a gentle tone of voice. • Be aware of your body language when having the conversation. Folded arms can look confrontational. Eye contact is good but don’t stare. Have your arms open and make sure your movements and the tone of your voice can’t be interrupted as aggressive or accusing in any way. • You can start by saying that you are worried about their memory and ask if they have the same concerns. They may have noticed they aren’t able to read or write too well lately, or they may have found themselves feeling moody and agitated, or forgetting things more often. However, they may deny that anything is wrong. If this happens, don’t argue with them. Without directly disagreeing with their views, you could give specific examples of things that have happened lately to cause concern. Be specific and make sure you have a couple of key incidents. But be prepared for the fact that they may not remember them. • Be ready for any reaction. The person may be angry, upset, confused or frightened. They may deny anything is wrong and become agitated, or they might express concern themselves. They may be pleased or relieved that you have noticed that something is wrong, or they may be embarrassed. If they react angrily and it becomes apparent that they are not happy to continue the conversation, leave it and try again another day when they are in a better frame of mind. Remember, if they do have dementia, their moods can vary tremendously. Sometimes it’s best to accept that today is not the day to have the conversation. You may have more luck next time. Equally, they may need time to digest what you are saying. They may come back to you at some point and admit they are worried. • Reassure them at every stage of the conversation. Let them know you are there to help and that you want to make sure they are OK.
• If they do open up about concerns they have, ask them what they have been finding difficult lately and where they think they need help. Afterwards, make a note of anything they tell you so that you have specific points to discuss with their GP. • Try to put yourself in their shoes. If you were having the conversation with a person who was telling you they were worried about you, you may not want to admit that anything is wrong. You’d be scared and possibly embarrassed. Remember this and be sensitive when you have the conversation. • At the end of the conversation, agree and decide on an action plan of what will happen next between the two of you. If you have both agreed to visit the GP, offer to make the appointment and reassure them you will go with them. • If their memory is poor, be prepared for the fact that they may not remember the conversation the next day. If you arrive on the day you are scheduled to see the GP and they don’t remember the conversation or agreeing to visit the GP, then briefly explain you both agreed to see the GP about their memory. They may refuse, and maybe they aren’t ready to accept there is a problem. They may need more time to come to terms with the fact that something is wrong. • If they refuse to seek help or admit there is a problem, and you strongly feel they should see their GP, you could mention your concerns to the GP next time you take them for a routine appointment such as a flu jab or a blood test. • Finally, be prepared for the fact that they may not have dementia. So don’t be prescriptive and say you think they have dementia. For further advice, call the National Dementia Helpline on 0300 222 11 22.